Linked to the cult of the nymph Egeria, the spring was already known to the Ancient Romans for its curative properties. Already known to the ancient cults as a place holy to the nymph Egeria, and cited in the works of Livy and Ovid, the spring has been renowned and appreciated since the times of Early Rome. Considered “sacred and miraculous” even then, it acquired fame for treating stomach illnesses during the reign of Tiberius (14-37 AD). Springing from the source, the water met the Almo river and was collected in a large lake, Lacus Salutaris, known for its water’s therapeutic qualities. Around 100 AD, the Nymphaeum became part of Herodes Atticus’s luxurious Triopio, the famous villa/farm dominating the entire Caffarella Valley. Upon the fall of the Roman Empire along with its splendour and its palaces, the irrigation and reclamation works sunk into ruin and wild nature regained the upper hand. The barbarian age was likely the darkest time for the spring. The entire park, wedged between the Appian Way and the Via Latina, lay in fact on the route travelled by invading armies. But starting in 1400, the spring embarked on a new phase of popularity linked to healing, considered miraculous in those times. Experiencing its effects personally, many physicians and scholars began to describe its beneficial and curative properties in their scientific books and treatises. To confirm the now firmly established fame that gave the spring its nickname “Santa,” Pope Alexander VII, who cured his kidney stones by drinking from the spring every day, decided to put in place a stele, which has now disappeared, as a monument to its therapeutic qualities. The nymphaeum becomes a pilgrimage destination for young artists of the European aristocracy. The first thermal facilities, and the carts pulling the acquasantari – the vendors of “holy water” – come into being. Between 1700 and 1800, the nymphaeum of Egeria became a destination for the young travellers of the European aristocracy: Chateaubriand, Verri, Goethe, Andersen, and Piranesi left descriptions and drawings of the place. For Romans, too, the spring returned to being a place to visit, as shown by some prints from the time, thanks to a typical inn outside the city wall. 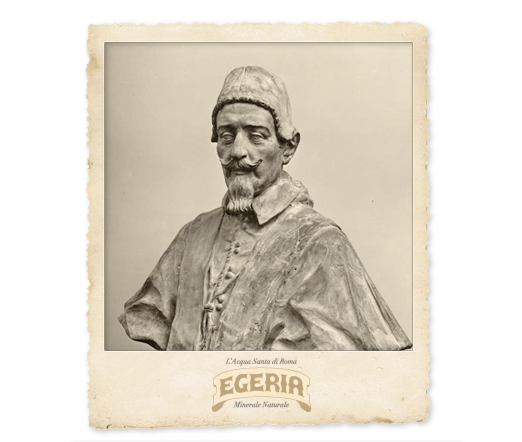 The first thermal facility was built by Ospedale San Giovanni, the hospital that owned the land where the water flowed out, with the financial protection of Pope Pius VI and the contribution of Banco di Santo Spirito. In 1818, two roads suitable for vehicles were built to link the facility to the city. In 1895, professor Leopoldo Taussing incorporated a company and invested considerable sums to restore the channelling, build elegant glass water fountains, improve the spring’s surroundings, and create modern bottling departments. A special omnibus service from Porta San Giovanni was organized, and the carts pulling the “acquasantari” – the vendors of “holy water” – began to make their rounds in the city, advertising the water. The company is founded, and glass line production begins. Door-to-door sale begins. 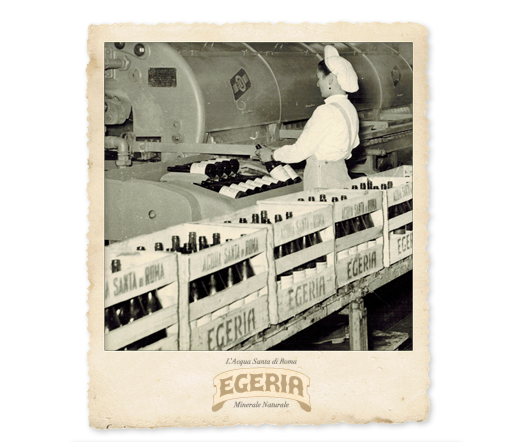 In the first half of the twentieth century, the habit began to spread of visiting the Egeria spring, especially on Sunday, to fill 10-Lire bottles. In 1948, the company “Acqua Santa di Roma srl ” was founded, and the first glass product line was opened. Placed on buggies, 92 cl and 190 cl bottles were transported to all areas of Rome. In 1950, the young Mari brothers, sons of then-owner Domenico, had the idea of reusing the cases that held bombs during the Second World War to transport bottles more easily, using American military vans. Knocking from door to door, the Mari brothers themselves would answer the homeowner’s “who is it?” with “L’Acqua Santa di Roma” – “Rome’s holy water. 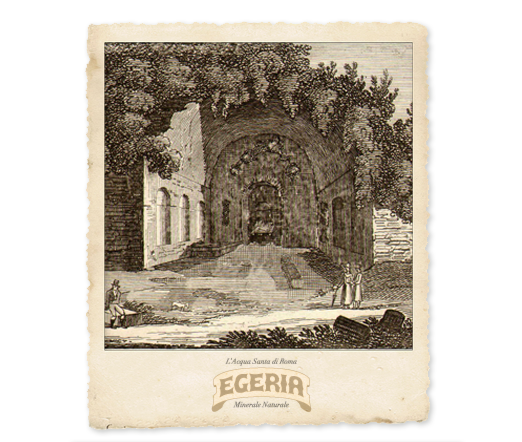 The first “Egeria” label was made, entirely illustrated by hand. In 1961, the Mari family officially launches the first label, designed by hand by a very young fourteen-year-old illustrator. 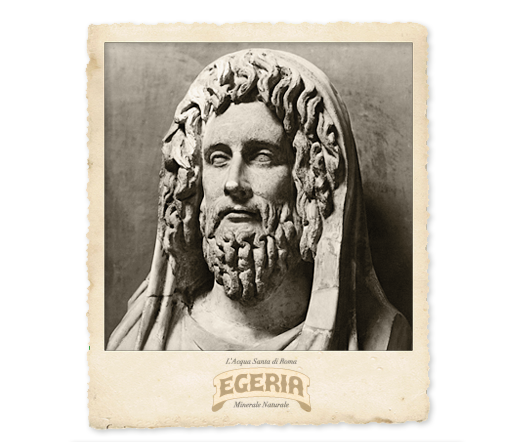 The boy was attending the art high school when he was given the job to design the label for Egeria mineral water for 500 liras. The cave image is inspired by an instantaneous photo of a dark and ruined bas-relief, of which very little detail can be seen. 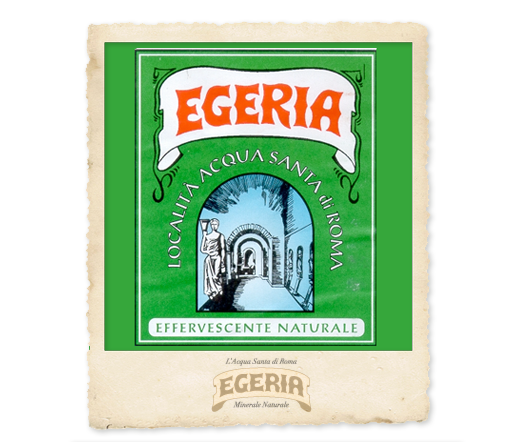 However, for more than 60 years, this same illustration has remained printed on every Egeria mineral water Label. Logistical modernization, increased production, and distribution abroad. The company officially joins the market leaders. The 1980s were boom years in mineral water consumption. Facilities no longer met the growing demand from all of Italy, and the market was destined to grow. The Mari family thus decided to quickly strengthen and renew both the production and the logistical sectors. The now inadequate vans for distribution were replaced by modern tractor-trailers and semis, and the old OM vehicles – the “Lupetto,” “Tigrotto,” and “Leoncino” – were parked for good. Production also intensified and adjusted to what was to become the future of containers: PET. In the late 1980s, the first PET bottling plant was opened, and container production began at that same facility. At the same time, more modern machinery was installed in the glass department, and references increased. The old bottles were replaced with new, more elegantly designed formats in white glass, to satisfy the overseas market with greater prestige. 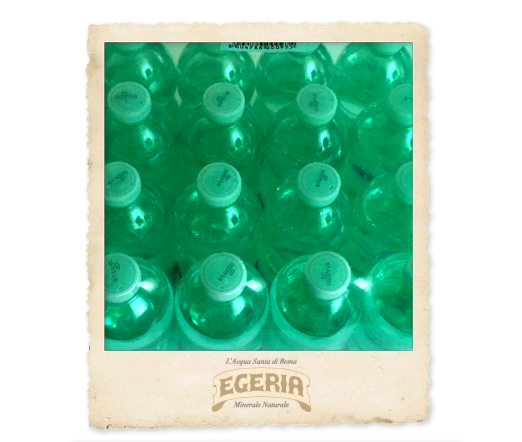 The corporate agility with which all these sectors innovated, adjusted and improved to follow a quickly evolving market was to allow Egeria water to take its place among the market leaders – a position it has maintained to this day. Parco Egeria is inaugurated: more than a hectare of parkland in the heart of Rome. The company continues to grow, as it embarks on brand restyling and repositioning. As the new millennium was ushered in, the Mari family’s desire was to continue to grow, by further strengthening the production sector. 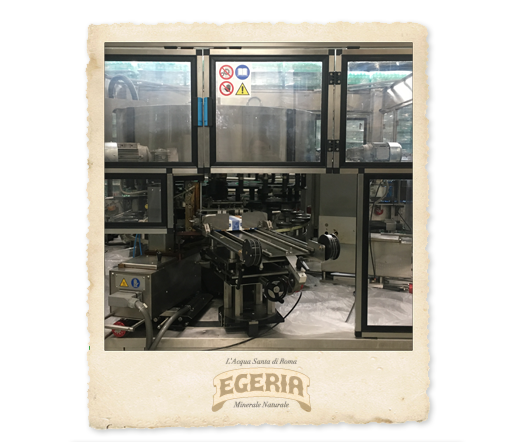 New PET production lines were installed and modern machinery was introduced to overhaul the existing plant. Special attention was devoted to returnable and disposable glass, increasingly in demand overseas. New developments also included the reclamation and recovery of the areas surrounding the facility, immersed in the green landscape of Parco dell’Appia Antica – the Appian Way park. At long last, 2004 saw the creation of Parco Egeria, more than one hectare of land equipped with a playground, a food service area, a green area for strolling, and an area dedicated entirely to our four-legged friends. The expansion of the area accommodating the water fountains open to the public, from which water can be drawn directly from the source, has made visiting the park even more pleasant. But the immediate future will certainly be no less dynamic. The restyling of the brand and of the corporate identity has ushered in a three-year plan which will include new packaging offers and formats. The brand repositioning, in addition to confirming leadership on the Rome market, will help perfect the company’s internationalization process. All this is supported with an intense communication plan programmed on both online and offline channels.